I have 115,000 Miles on the Michelin LXT AT2 tires. I ran them fine in the last Minnesota winter. These have been the best tire I have owned. They plow through snow, not bad on ice, stop on a dime on pavement or gravel. On gravel you have good control and grab and you do not get thrown around as much as the LTX MS.(Also good) The LTX AT2's are excellent in Rain. I have been through moderate mud 6" deep, no problem. These ties are quiet even though I have 115,000 miles on them. I cannot think of anything negative about the tires. If you want a great tire, this is it, and worth every penny. Replaced the original BFG's which rode hard and slipped in rain with these tires. Best tires I have had. After 48K miles they are still good. I have 49000 on this set. Good consistent performing tire. Quiet too. Love the Michelin brand. I feel like the tires take care of my truck, most definitely will be buying again and again...and again. I would buy these tires again. Don't know where to begin. Best tires ever. Rain, mud, snow, ice, towing a heavy load they never missed a beat over 80,000 miles on this set. I didn't rotate them at all. 4th winter season they've seen. Just now considering replacing them. 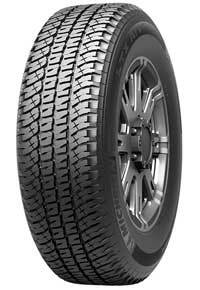 I purchased these tires for my Explorer and had 60,000 KM on them when I sold the Explorer and they still had lots of tread on them and they were handling the road conditions as if they were new. I will buy them again when I need new tires for my other vehicles. This is my second set. 1st set 85,000 miles. Hope to get the same out of these. I replaced the stock tires of BF Goodrich - Longtrail Radial with these LTX AT2. A night and day difference as far as wear and handling goes. Good tires and they last a while, too. Good tires and good service. Best tire I ever owned. Will never buy anything but Michelin. Good driving but not full 60,000 miles. Not too happy.